If you thought that our Yummy Bull was a virtual one you´re totally wrong. Because our bull lives happily in a ranch 30 minutes driving from Oklahoma City. Weird? Let me tell you a short and inspiring story… Every November Microsoft organizes a fundraising campaign called Giving. Yep, the name is not really original but the idea is great. For every dollar that you donate for a cause the company adds the same quantity… Until $15,000. Apart from the conventional giving, theres is an auction in which the employees offer a reward to the best bid for a good cause. My husband, Microsoft employee, told me that one of the reward was giving a name to a bull that one executives of the company raises in his ranch of Oklahoma. Having a real Yummy Bull and doing something fulfilling for the giving month led me to ask for help to my husband: “We need to win this”. And luckily, he didn´t fail to me. So we finally we have our real Yummy Bull and United Way has an extra financial help to keep on with is huge labor in the King County. The next step: visiting him as soon as possible in the sunny wide prairies of Oklahoma. Muuuu! 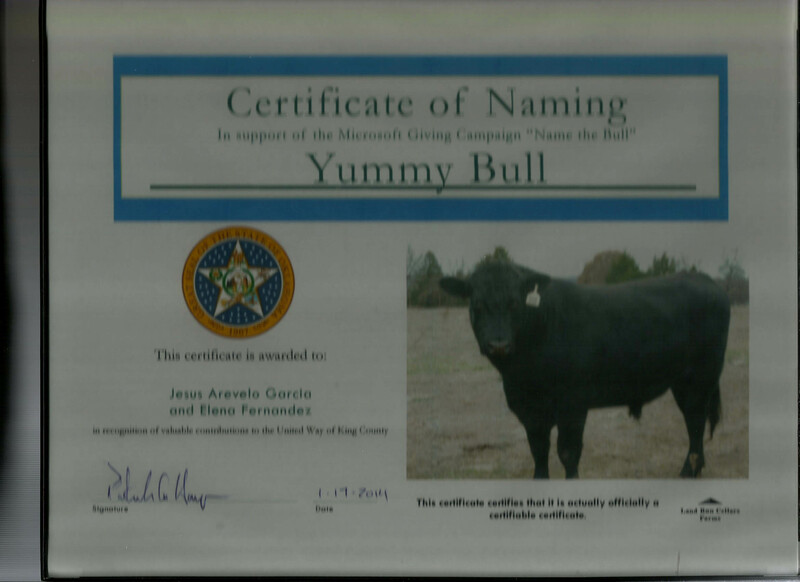 Posted on February 8, 2014, in Non profits and tagged Giving, Microsoft, Oklahoma, United Way, yummy bull. Bookmark the permalink. 1 Comment.